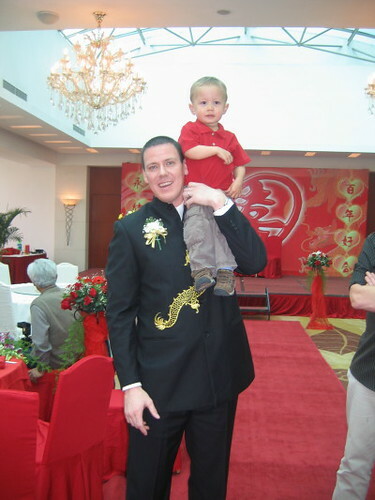 We were attending our first Traditional Chinese Wedding this past Saturday. 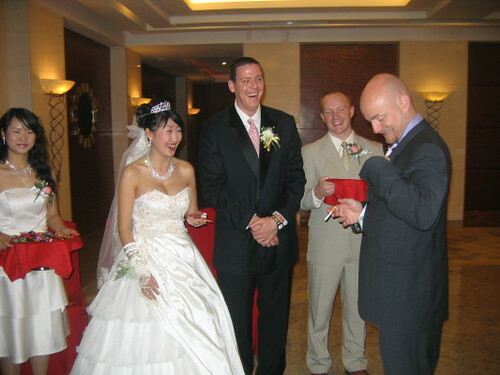 Our friend Rock married a local Chengdu girl, Shao Hua at the Kempinksi Hotel. They were actually married back in February, but most Chinese people go and get their marriage certificate and then save the ceremony for a later date. Some people wait years before having a ceremony. 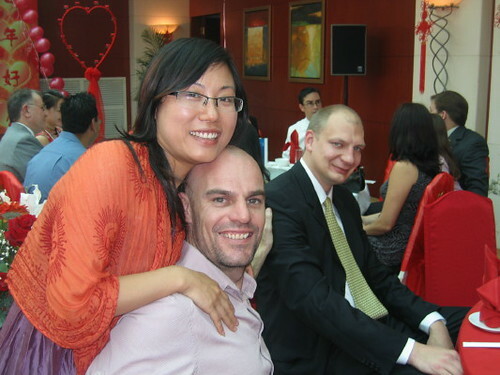 Rock and Flora decided to their ceremony now because they would be moving to Dalian in May. 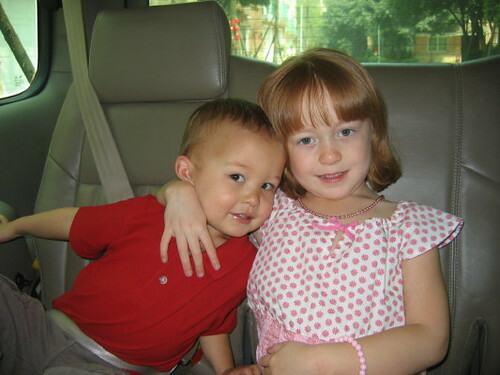 Here are the kids in the car before the wedding. 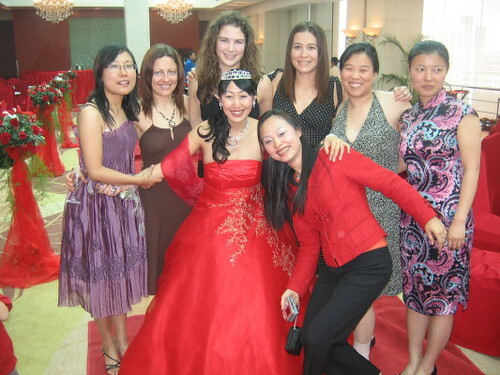 Gemma was over the moon about attending a wedding. Here was the sign before heading into the reception. 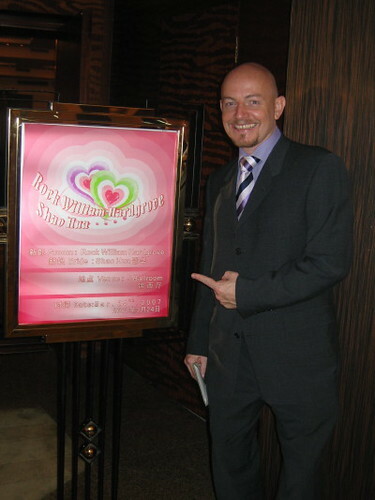 The Chinese are very romantic and are into hearts and pink! When we arrived to the hall where the reception was to take place we were greeted by the happy couple and their wedding party. Jonny was offered a cigarette by the best man and candy by the maid of honor. Our friends Lily and Mark. Gemma and her classmate Tyler. 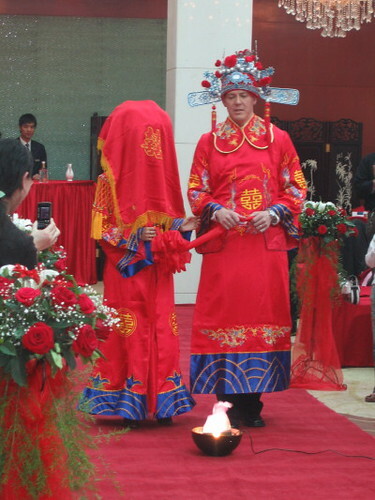 The ceremony began by Rock and Flora walking into the room in Traditional Chinese robes. They hoped over this pseudo-fire, then over a little bridge and under 3 red scarves. He was blindfolded and had to choose his wife through a line up by touching several women and one man's hands. Luckily he figured it out otherwise it would be bad luck to their marriage. After this Rock had to remove Flora's veil with some type of scepter. They also lit a heart-shaped candelabrum with tea lights around the heart. It was kind of like a unity candle. There were speeches by Rock and Flora's Father and our dear friend Isabel did all of the translating, which was quite helpful. Quite a few of the invite list involved the rugby club. Here are the rugby boys. Here are the rugby girls! As you can see Rock and Flora changed clothes again. 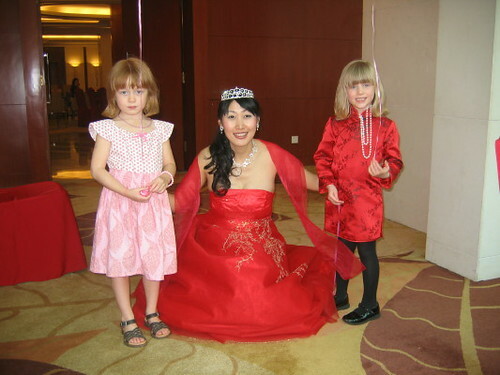 The red is a very lucky color in China. Gemma and her friend Maggie with the bride. After the lunch most of the guest headed to karaoke. Of course the rugby crowd opted for a little bit of rugby on TV. After that we headed to the evening dinner and ma jong. The evening dinner was absolutely fantastic! It was probably the best Chinese food I have had in Chengdu. 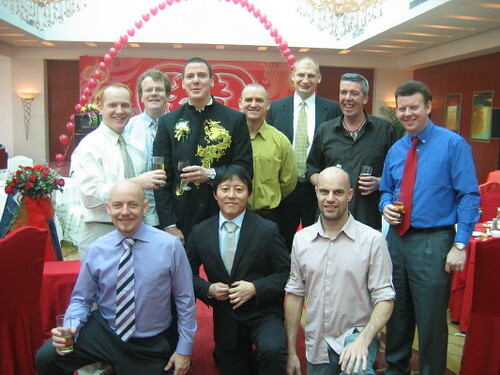 There were quite a few of similarities in Western wedding vs. Chinese weddings. I am so happy that I have had the opportunity to experience both! Best of luck to the happy couple! That looks beautiful. You are so fortunate to get to experience something so unique. You all look great as always. I love Gemma's dress.